A collaboration between geneticists and an artist invites us through the looking glass into a speculative future, finds Anna Kriebs. Anna Kriebs is an associate editor at Nature Communications in Berlin. ÆON STATE Studio Berlin Until mid-January 2019. Among the flood of putative benefits from gene editing, longevity is a dream as old as myths. But what are the human and social implications of boosted lifespans? That’s the question probed by an intriguing Berlin exhibition. Finnish speculative-design artist Emilia Tikka worked with researchers using CRISPR–Cas9 for two months to produce ÆON, a multimedia artwork. At the Max Delbrück Center for Molecular Medicine (MDC) in Berlin, Tikka experienced the daily frustrations and eureka moments of the scientists as she familiarized herself with a technology that could have a profound impact on the way we live. Her reflections on such societal shifts thus spring from a personal, immersive experience. ÆON is now on show at STATE Studio Berlin, a new gallery dedicated to the intersection between art and science, until mid-January 2019. The CRISPR–Cas9 system is often compared to a pair of molecular scissors allowing the precise cutting and editing of DNA. Fittingly, Tikka’s work is clean and minimalist. But that simplicity amplifies a visceral and emotive message. ÆON’s Berlin debut was a packed preview, where the work seemed to float above the crowd. 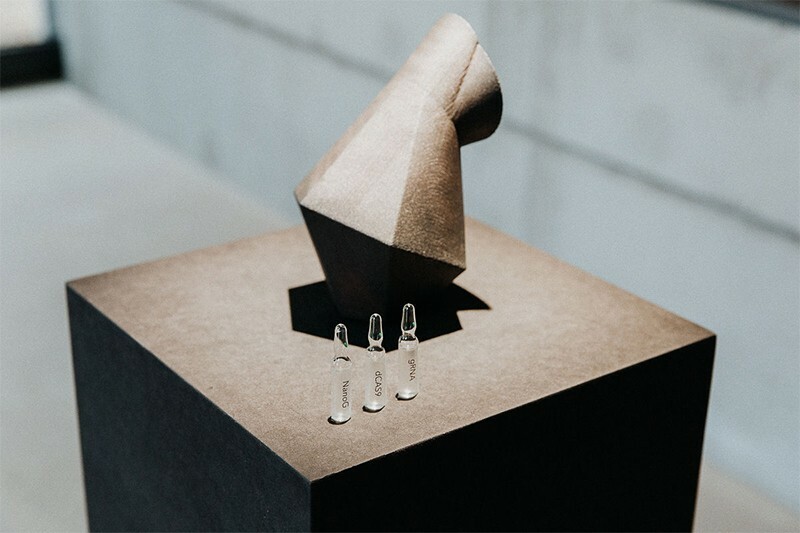 Tikka’s piece consists of a fictional sculpted CRISPR–Cas inhaler, more akin to a lifestyle accessory than a medical device. 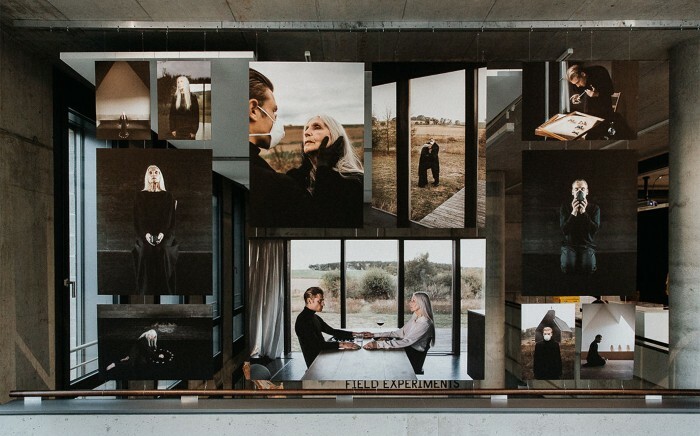 Next to it, a triptych of photographs taken by Zuzanna Kaluzna under Tikka’s direction tells the story of a man and woman whose lives and relationship are touched by this possible future application. The man maintains his youth through regular inhalations; the woman has chosen to age. What this means for their relationship can be seen in Tikka’s starkly poignant, near-monochrome images showing them together and apart, in meditative poses. There is an intensity here reminiscent of work by Ingmar Bergman, the Swedish film director. This is an artwork inviting us to step through the looking glass, rather than take a right turn at the corner of science and fiction. Unlike the research literature on the subject, ÆON invites deeply personal reflection. Tikka’s goal is not, of course, a feasibility study. She hopes to spark discussion about the dimensions of CRISPR beyond science. And on one thing, all parties agree: the technology is not yet able to extend life. But it’s good to talk about what might happen if that day came. And that kind of debate is exactly what occurred. As part of Berlin Science Week in early November, a panel discussion featuring Tikka and MDC scientists (including bioethicist Jens Reich and computational scientist Roland Schwarz) highlighted that to categorically shun certain kinds of research on ethical grounds also means giving up control over regulating the technologies that emerge from it. However, to facilitate productive discourse, science has to be transparent and open. As Andreas Ofenbauer, a molecular biologist at the MDC, points out: “The things that move researchers are often very small, like a single molecular interaction.” Tikka’s residency, he says, reminded him of the context — the implications that this technology could have for people and societies in the future.